Studio safety is key to living a long and healthy life as a potter. In our line of work, we can come into contact with many different job hazards that can cause us grief down the road. Being cautious and taking preventative measures is the best way to stay safe in the studio for the long term. In this article, we have 10 ways to make your studio safe and 10 ways to keep yourself safe and healthy while pursuing your passion for pottery. When you let clay sit out to dry and then it is moved around or brushed, silicate dust can be stirred up. 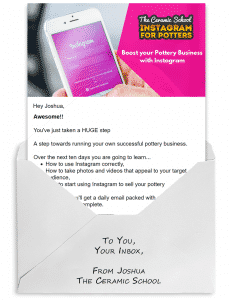 This most commonly happens at pottery wheels where the trimmings might be left out and can become bone dry over time. It is important to take precautions and wet the dry clay to capture the silicate dust before it becomes airborne and then clean the area up. 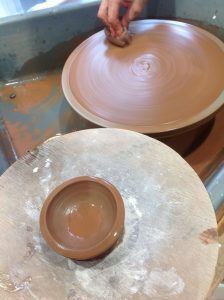 Cleaning your pottery wheel regularly, storing clay in containers or bags, and removing clay trimmings when they are still leather hard is best for keeping the dust to a minimum in the studio. Wiping down surfaces will trap particles before they become airborne. This is important for clay dust that occurs from trimming and clay or glaze mixing. When there is a large amount of dust, spraying down the area or wiping it down with a wet cloth or sponge can trap the particles and keep you safe from inhaling particles into your lungs. Keeping multiple sponges or rags can help make it easier and more of a regular habit to clean up surfaces when you are done working. Keeping powders stored in air tight containers is best for your health, and the longevity of the powders. When powders are stored it prevents you from inhaling the particles that might get stirred up if left uncovered. Another benefit of keeping your powders stored is that it prevents moisture or other contaminants from getting mixed into the powder and ruining the integrity of it. There are many different container sizes that can accommodate powders of all quantities. Having a safe kiln location can help prolong the life of your kiln and stop any potential fires from occurring as well. Concrete is the optimal flooring to have, and keeping the kiln far away from walls and other kilns will prevent the heat from melting anything near the kiln. Be sure to keep all flammable materials and liquids far away from the kiln in order to prevent fires and explosions from occurring. Remember to use metal shelves instead of wooden ones if they are close to your kiln. Having an emergency shut off for kilns and other powered tools is important when things go awry. 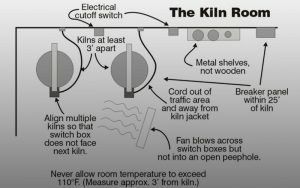 A breaker for the kiln can shut off the power to the electric kiln in case there is a serious issue. Other tools such as pugmills, slipcasting machines, drills, and so on should be shut off immediately and then unplugged if there is something wrong with it. These steps can help ensure that the machine is not accidentally turned back on during the emergency or when it is being inspected. Clean pottery tools are important for the longevity of your tools and the safety of yourself. If you have a rusty tool and cut yourself you will need to worry about tetanus. 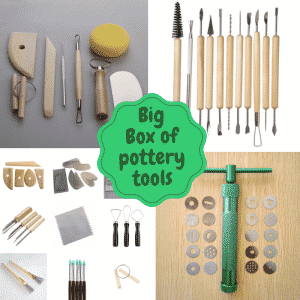 Cleaning your pottery tools once you are done with them can help your tools to last for a very long time. It also helps to prevent silicate dust from getting stirred up when you are digging around a drawer filled with clay covered tools. Toxic liquids should be contained in a cabinet when not in use in order to prevent spills and unintentional exposure to said liquids. These liquids should be clearly labeled and handled with care depending on the toxicity of the chemical. Remember to keep warning labels on the front of these containers too in order to know what to do when you are exposed to the chemicals. Venting toxic fumes is very important to staying healthy in the studio. 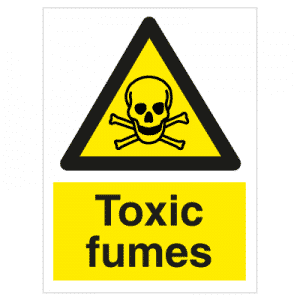 It can be very hazardous to your health to breathe in chemicals that can cause you to be sick or pass out from exposure to it over time. Remember to be safe and use a vent and respirator or work outside and wear a respirator . Cleaning the studio can help you organize your tools and clean away clay dust that manages to get everywhere. Long-term exposure to silicate dust can cause serious damage to your lungs so cleaning up the floors, tables, around wheels and tables can go a long way to keeping your lungs healthy. Venting the studio can be important when there is a build up from lack of cleaning in the studio. Opening windows and doors can help to remove dust and particles in the air that might cause damage to your health over a long period of time. Fresh air introduced into the studio can also help remove any funky smells that might have occurred from moldy clay or reclaim. Wearing a respirator is very important when doing certain tasks in the studio. These tasks include cleaning dusty areas, mixing glazes, mixing clay, handling and using toxic liquids, and measuring powders. A respirator can help prevent particles that become airborne during any of these tasks from getting into your lungs and causing long-lasting damage. If you do not wear proper footwear, which is a pair of closed toe shoes , then serious damage can occur to your feet. Dropping tools, hot bisqued or glazed pieces, or kiln furniture can cut your feet up or even break some bones. Wearing the right footwear in the studio can help keep your feet safe and injury free. Taking care of injuries is important as soon as they happen. This includes burns, cuts, and more serious wounds. 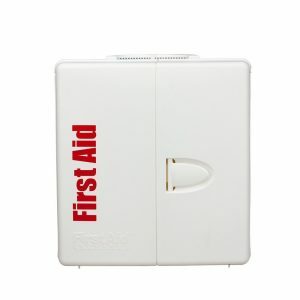 Its best to have a first aid kit in your studio, they cost less than $50 and can even be mounted to the wall . Our hands and feet are very important to our craft and it is important to take care of ourselves as much as we take care of our pottery. Treating wounds and staying away from chemicals with open wounds is important to avoid infections and longer recovery times. Be sure to wear gloves if you have a wound on your hand and you are handling clay or glaze. For more serious wounds it might be best to stay out of the studio until you are fully healed to ensure that you do not injure yourself further. Washing your hands after you are done wheel throwing or glazing can be very helpful to keep your hands and body healthy. Keeping the clay on your hands can cause your hands to dry out severely and eventually crack and bleed if you do not moisturize. We recommend using Porter’s Original Lotion and Udderly smooth to keep your hands in tip-top condition. Keeping glaze on your hands after glazing can mean that you accidentally get glaze in your mouth or eyes, which is extremely harmful and unpleasant. Keeping your hands clean when you are not in the middle of glazing or working with clay can ensure that you do not dry out or consume anything by accident that is on your hands. Proper venting in the studio can help alleviate built up dust and gasses that might accumulate depending on the work that you do in your studio. Smelly chemicals such as gold luster will need to be vented out since they are potent and can cause headaches if exposed to the smell for too long. Remember to air out your studio and use proper venting when mixing glazes since a lot of dust will be up in the air from mixing. It is also a good idea to wear a respirator as well to keep your lungs safe from small particles in the air that get stirred up while mixing glazes and clay. Protective eyewear is important when grinding down excess glaze. 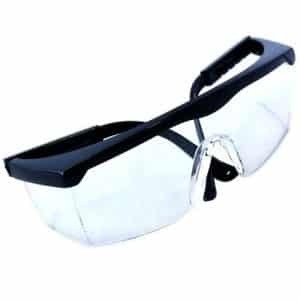 Glaze shards can fly off from the grinding wheel and end up in your eyes if you do not have protective eyewear . Face shields are also a good alternative to keep your entire face safe while grinding down the bottom of your work. Keeping track of your tools is important to avoiding possible hand injuries or tools getting into machines. Remember to check your bucket after throwing to ensure that tools and sponges do not end up in a reclaim bucket or pugmill. It is important to delicately check your bucket so you do not end up stabbing yourself with your needle tool while reaching into the bucket to grab the reclaimed clay. We recommend using a wall mounted tool mount to store your tools. Staying hydrated in the studio is very important to feeling energized and awake while working. If you find yourself feeling tired or drained, then drinking water regularly out of a water flask , might be able to help you. When you are dehydrated it can cause feelings of nausea, faintness, fatigue, dizziness and so on. Even if you do not feel thirsty you can be dehydrated so remember to drink water regularly. Eating in the studio can be very unsanitary. You could end up with clay, dust, or glaze on your food which you will then consume. Stepping outside of your studio can be a good break and a good way to prevent anything in your studio from ending up on your food. In conclusion, the studio is a fun place to be, where you can create beautiful and one of a kind pieces. However, it is important to be safe while in the studio to keep yourself healthy down the road and prevent health problems that could have easily been avoided from developing. We hope this article informs you about studio safety and how to keep yourself healthy while in the studio.